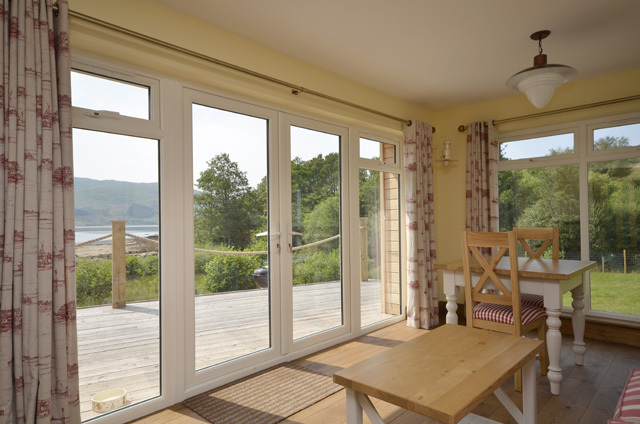 Sealight is located near the village of Strontian and enjoys a fabulous shoreline location with beach access and views across Loch Sunart. This unique property is architecturally striking and designed to take full advantage of the views. This part of western Lochaber offers some of the most spectacular scenery in Scotland and an abundance of wildlife. 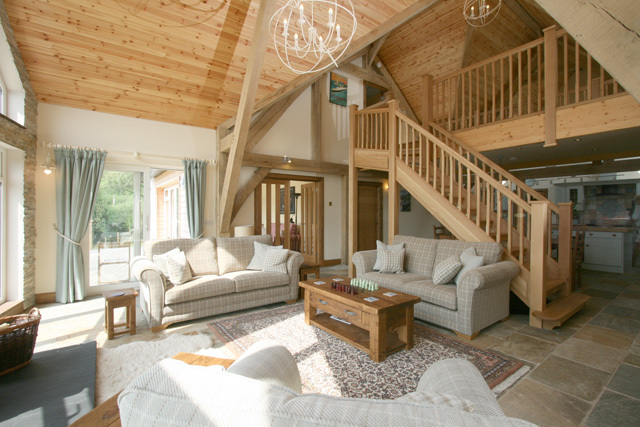 The property makes a perfect choice for a family holiday or for a romantic retreat. 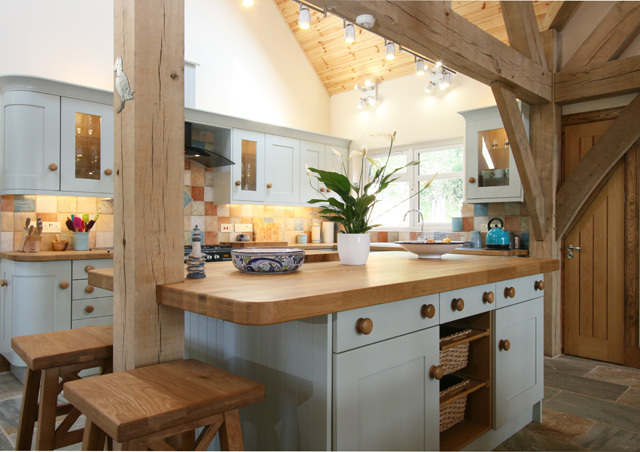 Inside the property certainly has the wow factor with floor to ceiling windows, vaulted ceilings with exposed beams and a modern open plan layout. 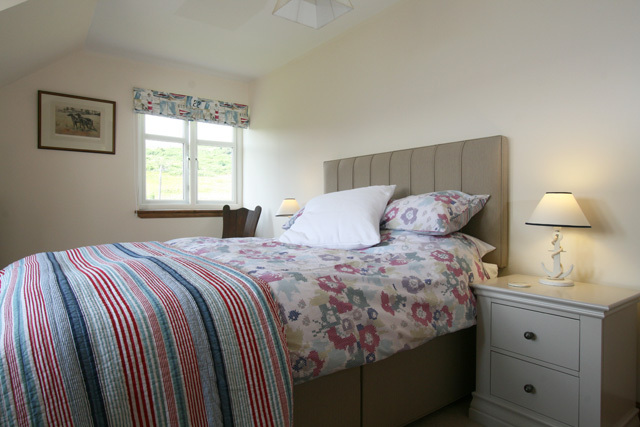 Beautifully furnished in a contemporary style, and equipped to the highest of standards, the accommodation offers a change from the more traditional holiday cottages usually available. 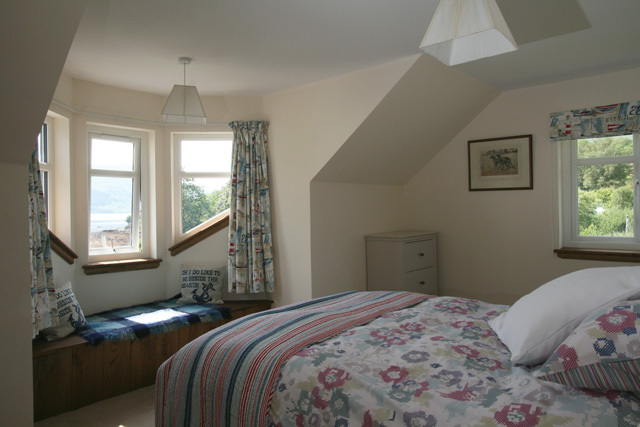 The accommodation is on two levels with the majority of the rooms enjoying either a garden or sea view. 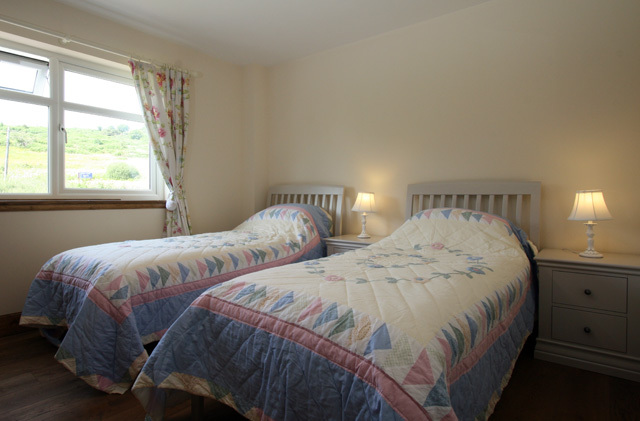 The main living accommodation is on the ground level, as is the twin bedroom, a utility room, and a family bathroom. 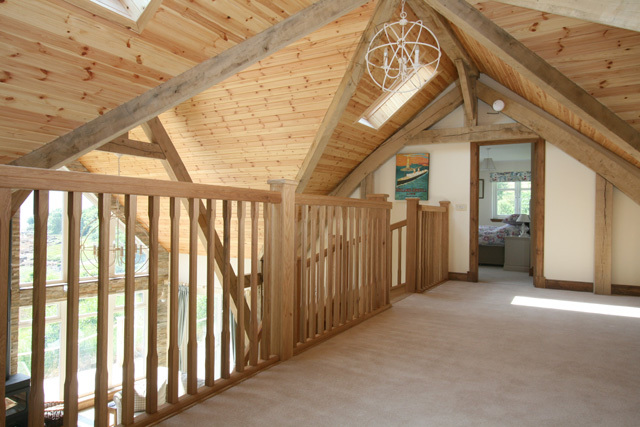 Upstairs the mezzanine area gives views to the lounge and kitchen below, and access to the master bedroom with its en-suite shower room. 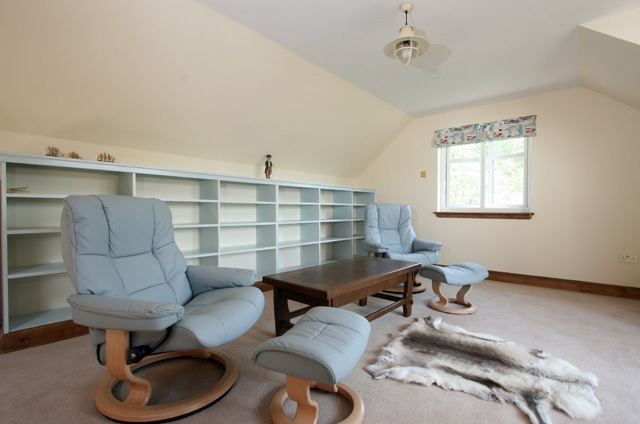 An additional sitting area is also available on this level, ensuring that no matter the size of your party, a quiet spot can be found to relax. Outside a decked area is situated at the front of the house, and from here direct access to the garden and the beach can be obtained. 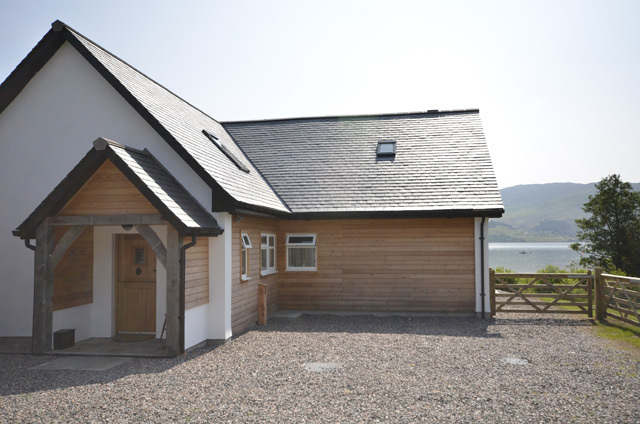 The owner has also provided garden furniture and a barbecue, ideal for a spot of alfresco dining after a day exploring, or simply to relax and enjoy the beautiful views of Loch Sunart. There is a good chance of spotting otters on the beach, sea eagle and golden eagle or a pine martin having an evening stroll on the deck all from the comfort of the house, telescope provided but bring your binoculars to add to the experience. There is also a very good wildlife hide just a few miles west of the house. Within walking distance of the property a small restaurant and pub can be found, however for a larger choice Strontian itself offers is located just two miles away. The village offers a good range of facilities for the visitor, including a selection of cafes, hotel restaurants, a general store and a tourist information centre. The Ardnamuchran area offers much for the visitor including an abundance of wildlife, quiet country roads for walking and cycling and some of the most beautiful scenery in Scotland. Various wildlife boat trips are available and day trips to the small isles are within reach. 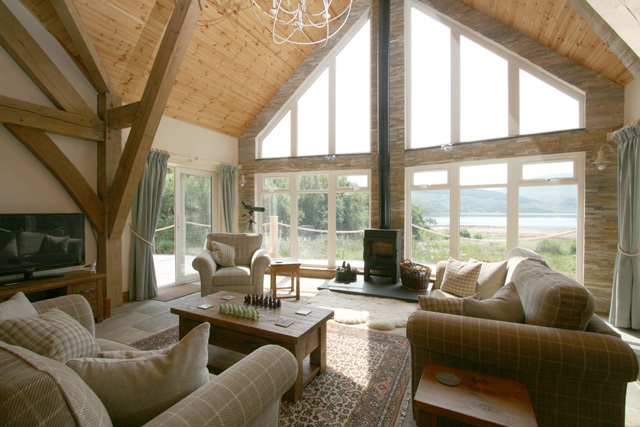 For those guests looking to visit Mull, the property is ideally suited for a day trip, travelling on the Kilchoan or Lochaline ferry which is located within an hours’ drive. 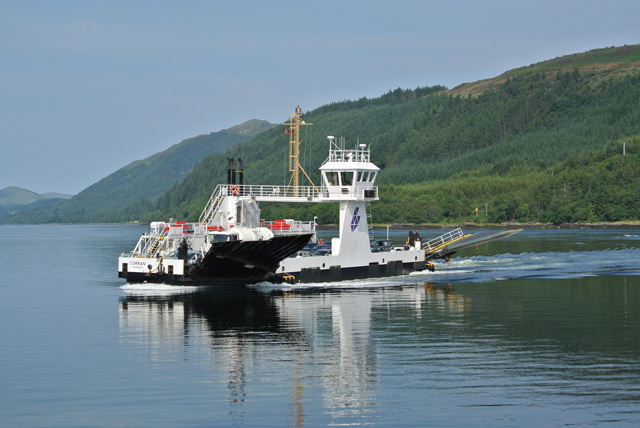 Please note the shortest and best route to the property would be to take the Corran Ferry from Corran which is located nine miles south of Fort William to Ardgour, a link to the timetable for this ferry can be found here. Due to various factors relating to safety at this property, children under twelve years of age are not allowed, babies welcome. At the time of booking please insert the ages of your children in the comments box on the booking form. Open plan living area with sea views. Sitting room with comfortable sofas, wood burner, TV with Freesat, DVD/CD, views to the sea and direct access to decked area and garden. 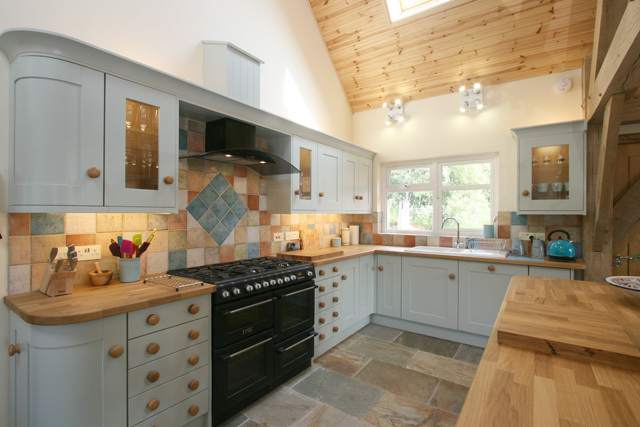 Kitchen, range cooker, microwave, fridge/freezer, dishwasher, and all the usual kitchen equipment, views to the sea. 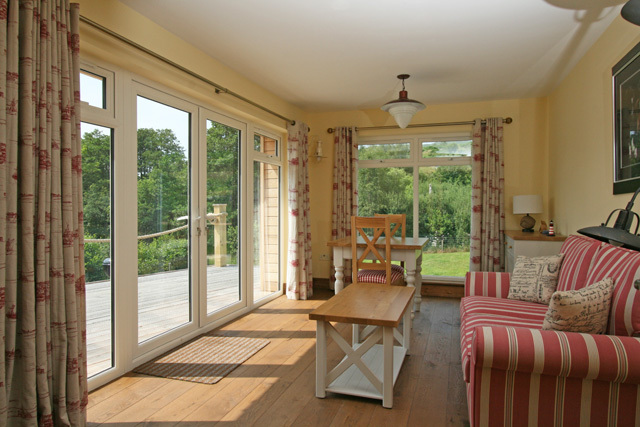 Breakfast/sun room, with TV/DVD, table and seating for four, views to the sea and garden. Bathroom with bath/shower over, wv, whb. Master bedroom, king size bed, sea views, ensuite shower room with shower, wc, whb. Galleried landing with sitting area, sea views. 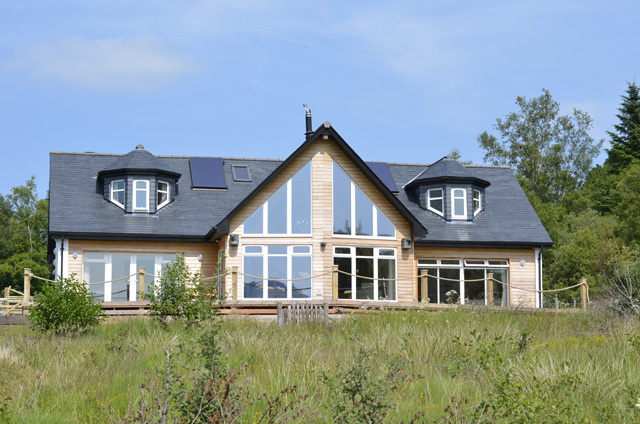 All electricity and heating costs, under floor heating throughout. A Good Housekeeping Deposit of £200.00 is required at the property. 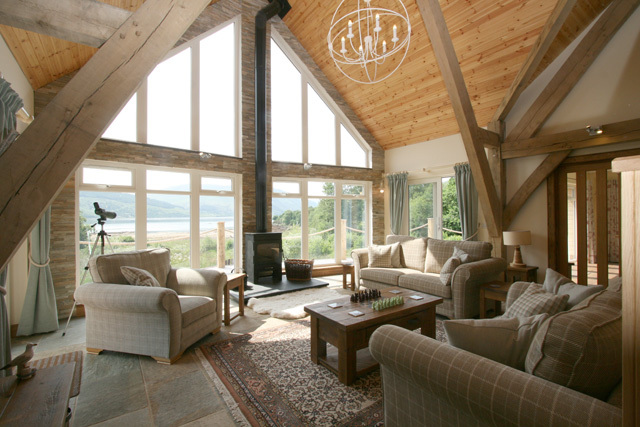 An ideal base for exploring the Ardnamurchan area. 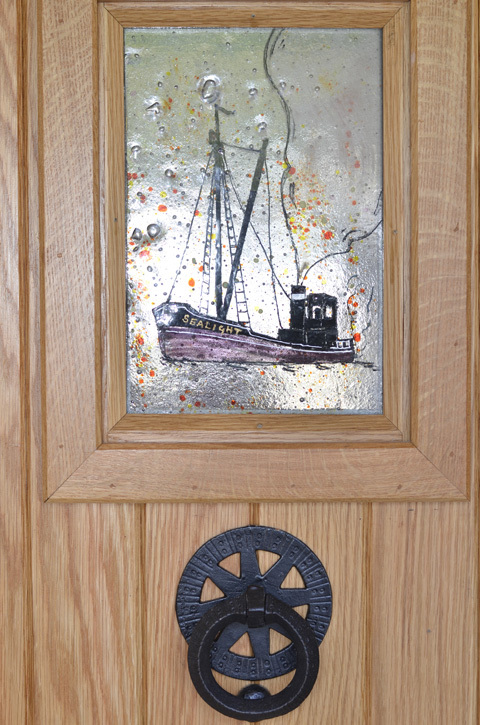 Sealight has the wow factor from the moment you open the front door. It is beautiful and very well equipped. The view from the decking is stunning. Pine marten visited every night. 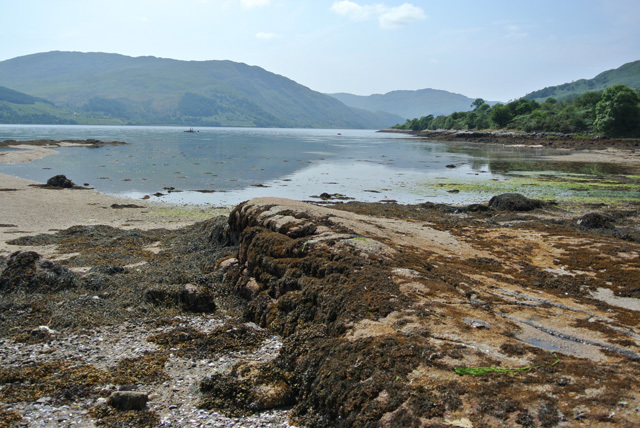 The area is so beautiful and the colour of loch Sunart changes by the hour, the view is never the same. The drive up from the South through Glencoe is one of the most breathtaking drives We have ever done. Before you leave stock up on a couple of days food as the nearest supermarket is a 15 mile drive and a trip on the Corran ferry away in Fort William. Saying that the local shop in Strontian is well stocked, just understandably more expensive. Go to Mull for the day, visit the Ncnnean distillery in Drimnin and have lunch at The Whitehouse in Lochaline. Sealight is the perfect house in the most perfect setting. A real get away from life holiday. A week is not enough. Another fabulous week spent at Sealight. This is our third year here for hubby and I and second year my parents have joined us. We love this place so much, it's like coming home. As always it was beautiful and clean and warm. The weather for our week was lovely with mild weather and sunshine. 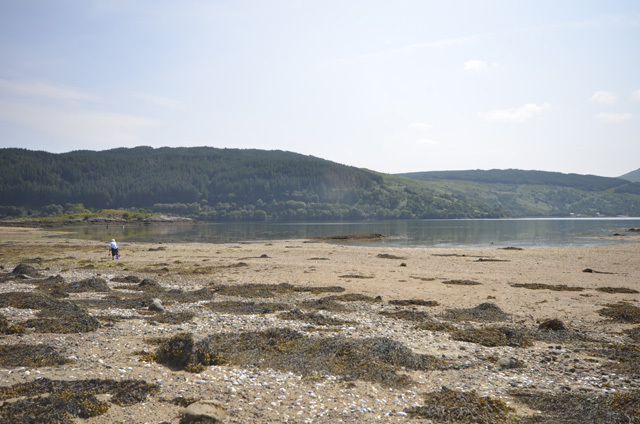 Fabulous day spent on Mull in almost summer weather. The pine martins came every night and this year we saw sea otters in the bay in front of the cottage plus roe deer in the front meadow. The birds were beautiful and we struggled to keep up with feeding them! We have already booked it again for next year. We loved Sealight clean well equipt and a beautiful house, we met Marty the pine Martin every night, seals and I'm sure a sea eagle sighting. Fantastic place. Splendid house in a great location with everything you could wish for. Very easy to find and excellent service from Wilderness Cottages whom I have used previously and would have no hesitation in using again. Exceptional property, absolutely top drawer. The view across the loch was beautiful, the weather changing the colours frequently. 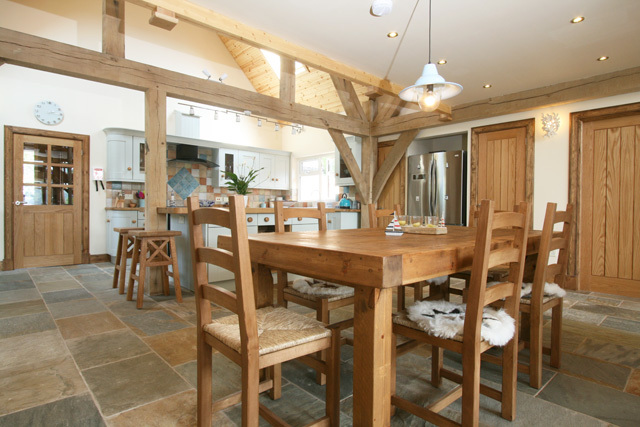 The underfloor heating kept the house incredibly warm & cosy. And there was the fire to enjoy too. Everything you could possibly need in the kitchen was provided. It was a real wrench to leave. Returned to this magical place and had the most relaxing week. We had fantastic sunny, but cold days whilst the rest of the UK was suffering from "the beast from the east". The pine martens came onto the decking for their peanut butter sandwiches and we saw countless deer and buzzards. This wonderful property feels like home, we will return again next year. The house was perfect in every way. The owners have thought of everything. It was very relaxing and comfortable with lots of space, and the view from the lounge was great, We enjoyed the lovely beach through the garden gate which opens out to the left for a longer walk when the tide is out, it was great to see the pine marten and all the birds so close to the house. We look forward to returning in the future. We had the most wonderful honeymoon at Sealight. We arrived at the end of October, staying for a week and unfortunately, this is the out of season period where most places are closed. 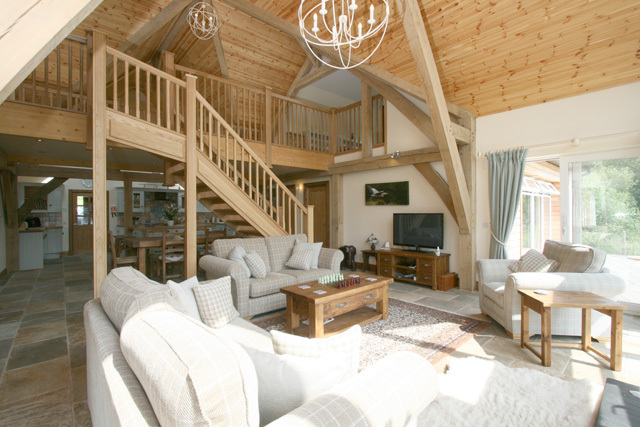 However, Sealight has everything you could possibly need to have a lovely, chilled, warmly stay. From books to every kitchen utensil you can think of and even jigsaw puzzles/games, we were never bored! The log burner was our favourite part of the house and we loved having the fire burning every night whilst watching a movie! We came home very relaxed and refreshed. Exactly what we needed! We are hoping to come back for Christmas next year. Fantastic property, fantastic location. We couldn't have asked for anything more really, the kitchen was by far the most catered for kitchen we've come across and we've stayed in a few. Pine Martens every night without fail, plenty of wildlife and great cycling with traffic free roads too. Great week and we will return very soon.